系统架构与硬件 - 向东博客 专注WEB应用 构架之美 --- 构架之美，在于尽态极妍 | 应用之美，在于药到病除 - 赢在IT，Playin' with IT,Focus on Killer Application,Marketing Meets Technology. vncconfig: unable to open display ""
# See ``man 5 dhclient.conf'' for details. ieee80211_load_module: load the wlan_amrr module by hand for now. 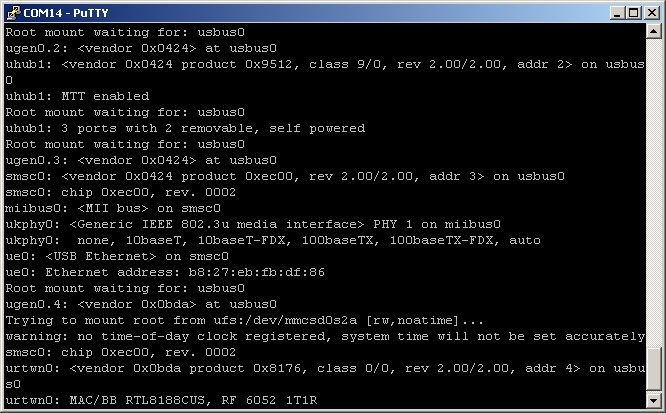 Setting up USB WiFi under FreeBSD is not a very hard task. We can use official handbook. But in my opinion it’s too complex. Here is a simple guide how to configure USB WiFi. Our goal is to configure WiFi interface to connect and use available wireless network. I use Miniature WiFi Module from Adafruit. This is in reality Realtek RTL8188CUS. elinux.org says this is a problem adapter. And I had some problems with it under Raspbian. There was no driver for this adapter in FreeBSD-10.0-RELEASE. Driver for this adapter appears in stable images in March. This is good for us, so we don’t need to adding it into kernel. urtwn-rtl8192cfwT: You need to read the LICENSE file in /usr/share/doc/legal/realtek/. urtwn-rtl8192cfwT: If you agree with the license, set legal.realtek.license_ack=1 in /boot/loader.conf. After reboot we can continue. How to execute a shell script/a command on Pi startup? root@raspberrypi:/# find . -name "mplayer.conf"
DPMS (Display Power Management Signaling) is a standard to reduce power consumption in monitors. /usr/bin/xset -dpms # disable DPMS (Energy Star) features. su pi -c "/bin/bash /home/pi/.xinitrc"
# Short-Description: Start or stop the HTTP Proxy.